The Village of Chenequa is centered on Pine Lake in the LAKE COUNTRY area of WAUKESHA COUNTY, approximately 30 miles west of the city of Milwaukee. In 2010 Chenequa’s population was estimated to be 590. The POTAWATOMI were the last native peoples known to have inhabited the area, with villages established on the eastern and western shores of Pine Lake. The Europeans who first settled around Pine Lake arrived via the Blue Mound Territorial Road (constructed in 1836), which connected Milwaukee to Madison and the Blue Mounds further west. In 1841 a small group of SWEDISH immigrants became the first Europeans to settle the area surrounding Pine Lake. Through the 1840’s the area around Pine Lake grew into a significant SCANDINAVIAN settlement, with Swedes populating the eastern shores of Pine Lake, and NORWEGIANS on the western shores. During this initial settlement period, residents called the area around Pine Lake New Uppsala, after the first settler’s home town of Uppsala, Sweden. As quickly as it had arisen, the Scandinavian settlement of New Uppsala disappeared; by the early 1850s nearly all residents had moved elsewhere or returned to their European homelands. In the mid-1850s the Pine Lake area began its transformation from a frontier settlement into an area of recreation and leisure for Milwaukee’s burgeoning urban elite. The area became increasingly accessible in the 1870s due to the introduction of a RAILROAD line through northern Waukesha County. 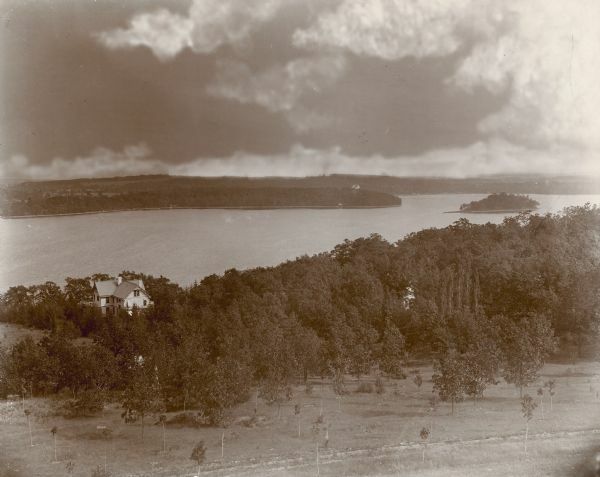 Many wealthy industrialists built summer homes on the shores of Pine Lake. In 1890 the residents and property owners on Pine Lake formed the Pine Lake Yacht Club. It was out of this organization that the Village of Chenequa emerged. In the 1920s Chenequa became easily accessible by automobile with the construction of State Highway 16. The construction of Interstate 94 through Waukesha County in the 1960s drastically reduced commute times between the city of Milwaukee and Chenequa, allowing for the conversion of summer homes into year-round residences. The Village of Chenequa was incorporated in 1928 to provide for fire and police protection and to control residential growth in the area. Since its incorporation the village has been maintained as a strictly residential community. Limits on lot sizes, along with restrictions on commercial and industrial development, maintained Chenequa as an exclusive upper-class enclave through the first decade of the 21st century. The village had one of the highest per capita incomes of any municipality in the state of Wisconsin, as high as $124,212 in 2010. ^ American Fact Finder,” Chenequa Population 2010 Demographic Profile Summary File,” accessed February 3, 2012. ^ William F. Stark, Pine Lake (Sheboygan: Zimmerman Press, 1995), 9. ^ Wisconsin Historical Society, “Territorial and State Roads,” accessed February 3, 2012, http://www.wisconsinhistory.org/archstories/early_roads/territorial_roads.asp. ^ Stark, Pine Lake, 96. ^ Pine Lake Yacht Club, Pine Lake Yacht Club, Chenequa—Hartland, Wis: 75th anniversary, 1890-1965 (Chenequa, WI: Pine Lake Yacht Club, 1965), 4. ^ Wisconsin Highways, “State Highway 16,” accessed February 3, 2012. ^ Wisconsin Highways, “Interstate 94,” Accesses February 3, 2012. ^ Village of Chenequa, “The History of Chenequa,” accessed February 3, 2012, http://www.chenequa.wi.us/History.html, now available at http://chenequa.org/about/history/. ^ American Fact Finder, “Selected Economic Characteristics 2010 American Community Survey estimates,” accessed February 3, 2012. Pine Lake Yacht Club, Pine Lake Yacht Club, Chenequa—Hartland, Wis: 75th anniversary, 1890-1965. Chenequa, WI: Pine Lake Yacht Club, 1965. Stark, William F. Pine Lake. Sheboygan: Zimmerman Press, 1995.